An extra large jalapeno. A hybrid whose parents include Keystone Resistant Giant and Early Jalapeno. 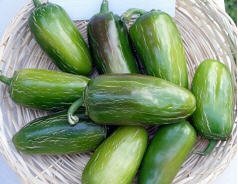 Perfect for making jalapeno poppers, as there is more room for pop! I had these at the taste of Madison food festival last year, they were stuffed with cheese, wrapped in bacon and smoked.......Oh so good.